Do you have what it takes to DODGE, DUCK, AND DIVE?!?! 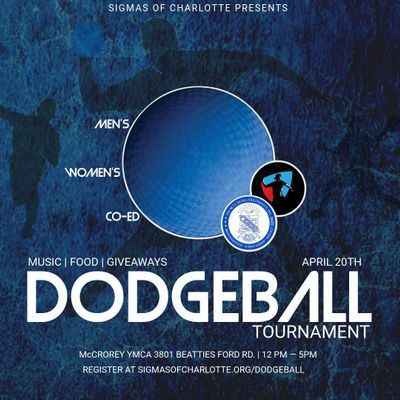 The Sigmas of Charlotte are hosting our first ever dodgeball tournament. 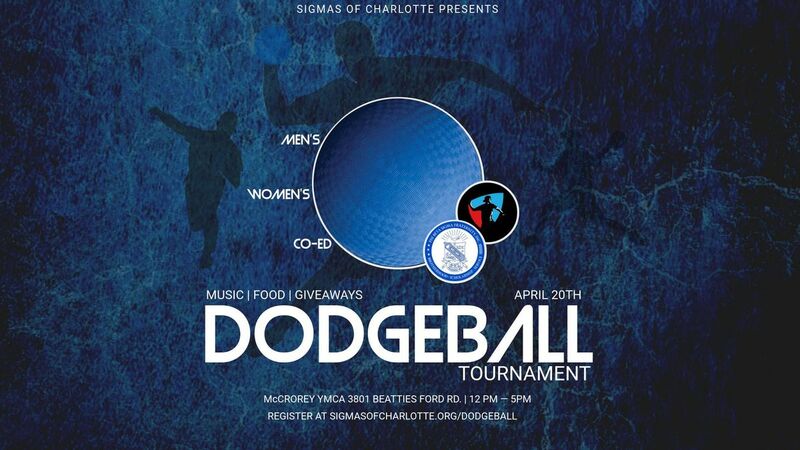 Proceeds support the Sigmas of Charlotte Social Action Committee programs! Sign your team up today! For questions or more information, contact Bro. Toby Powell at 704-287-0988 or dG9ieWwgISBwb3dlbGwgfCB5YWhvbyAhIGNvbQ==. Teams will be randomly selected to begin the tournament the day of event. Team Captain meeting begins at 11:30am. Q3: Will I be able to pay and register the day of the eventA3: No, All registration and payment should be completed by April 15, 2019. Teams must arrive at 11:00 to register and sign in Event starts at 12:00pmTeams will be randomly selected to begin the tournament the day of event. THE TEAMTeams will be made up of 10 players. Ten (10) players will compete on a side. IDEAL MEASUREMENTS: 60’ x 30’ – Identical to a volleyball court. THE EQUIPMENTThe official ball used in the tournament play will be a 8.25" rubber-coated foam ball. (1) A player is struck below the neck by a ball thrown by their opponent (the player will still be considered eligible If the ball that struck them was caught by themselves or a teammate before it hit the ground). (2) The ball they threw was caught by someone on the opposite team. If this happens the opposite team also gets a player out of the penalty box. (3) If you step out of bounds in an attempt to avoid being hit with a thrown ball. A ball is considered dead once it hits the back wall/bleachers or floor. It must be a direct hit in order to consider the person out of the game. Deflections off the floor, wall, court dividers, rafters, do not count as an out if caught. Deflections off a teammate—where the ball does not hit the ground or wall before hitting the second player do count, and both players are out. BOUNDARIESDuring play, all players must remain within the boundary lines. Players may leave the boundaries through their end-line only to retrieve stray balls. They must also return through their end-line. Players who have been called out cannot retrieve stray balls for their teammates, or that ball will be given to the other team. THE OPENING RUSHGame begins by placing the dodgeballs along the center line – three (3) in the middle of the center hash. Players then take a position behind their end line. Following a signal by the official, teams may approach the centerline to retrieve the balls. This signal officially starts the contest. Teams may only retrieve the three (3) balls from the center hash. Once a ball is retrieved it must be taken behind the attack-line before it can be legally thrown. TIMING AND WINNING A GAMEThe first team to legally eliminate all opposing players will be declared the winner. A 10-minute time limit has been established for each contest. If neither team has been eliminated at the end of the 10 minutes, the team with the greater number of players remaining will be declared the winner. If, after time has expired, there is a tie, then there will be a 2-minute sudden-death period between the remaining players where the first team to have a player eliminated loses. If there is still a tie, then it is double sudden death overtime in which there will be a “duel” between the two team captains. 10-SECOND VIOLATIONIn order to reduce stalling, a violation will be called if a team in the lead controls all three (3) balls on their side of the court for more than 10 seconds. This also applies to tied teams. RULE ENFORCEMENTAll contests will be supervised by a court monitor*. The court monitor’s responsibility will be to rule on any situation in which teams cannot agree. THE COURT MONITOR’S DECISION IS FINAL – NO EXCEPTIONS. *NOTE: During the Semi-Final and Final Round matches will be officiated by no less than two (2) Court Monitors. These officials will rule on all legal hits, out-of-bounds and 5-second violations. 1. Understand, appreciate and abide by the rules of the game.2. Respect the integrity and judgment of game officials3. Respect your opponent4. Be responsible for your actions and maintain self-control.